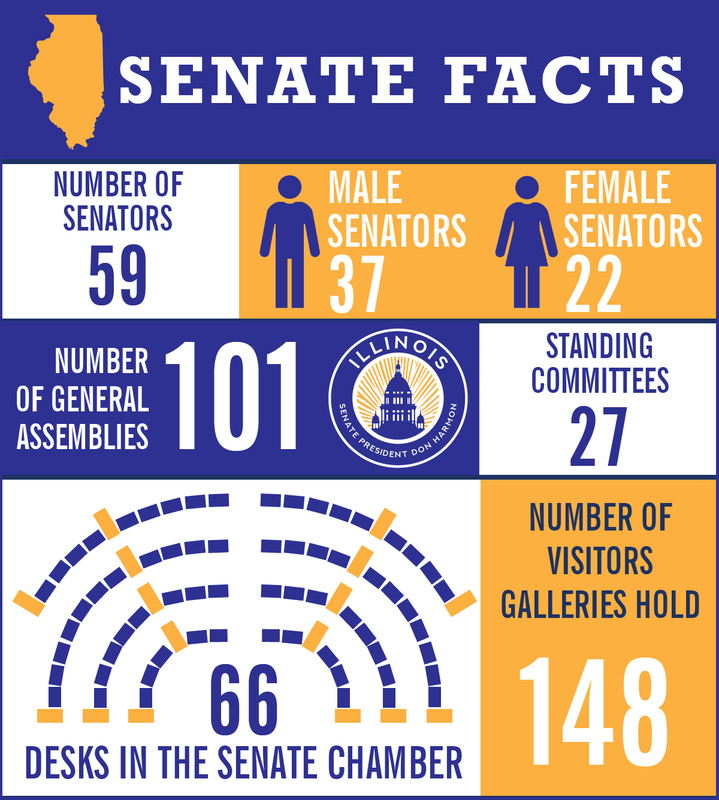 The Illinois State Senate is the upper chamber of the Illinois General Assembly. Together with the House of Representatives, the 59 members of the State Senate represent the legislative branch of Illinois government, passing legislation affecting the nearly 13 million residents of the state. Each Senate district is composed of approximately 217,000 residents and is represented by two State Representatives, each representing half of the Senate district. Terms of service are staggered and are either two or four-year terms based on district. The General Assembly convenes each year on the second Wednesday in January. In odd-numbered years, the first order of business is the election of the Senate President and the appointment of committee chairs and members. Senate President John J. Cullerton serves as president of the body and is elected by members of the Senate. Currently, there are 40 Democratic members and 19 Republican members. Each day’s session is called to order by the Senate President. A daily printed calendar outlines which bills will be considered and where the bills are in the legislative process. Before a vote is taken, each bill is debated by the members, whose opinions reflect their political viewpoints and the geographic regions they represent. The Legislature is the branch of government that makes laws. 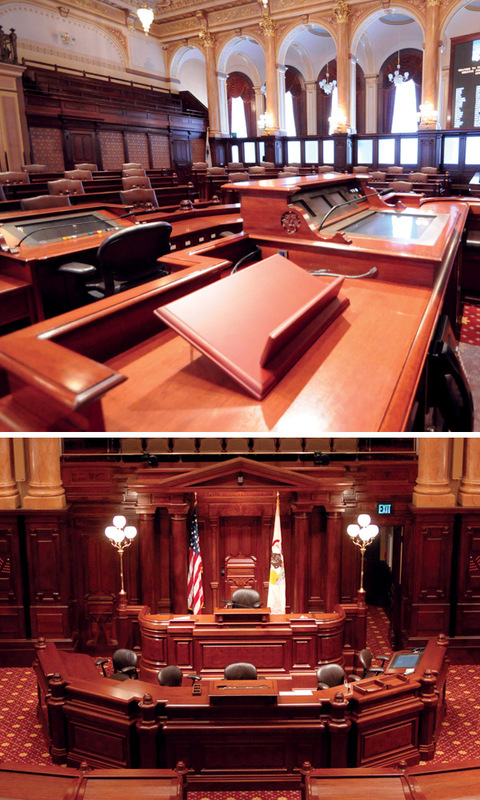 In Illinois, the Legislature is divided into two chambers – the Senate and the House. Per the state Constitution, there are 59 senators and 118 representatives who are elected to represent Illinoisans across the state. House members are elected to serve two-year terms, while senators are elected to serve either a two or four year term depending on the election year. Each senate district is divided into two house districts. State senators and representatives must be at least 21 years old, a United States Citizen, a registered voter and a resident of their district for the two years prior to the election. Illinois’ legislative session typically runs from January through May 31 and for two weeks in the fall. Every 10 years, the boundaries of a legislative district are examined and redrawn to reflect changes in the census. Every two years, the Senate elects a President and Senate Minority Leader. Beginning in 2017, an individual may not serve as Senate President or Senate Majority Leader for more than 10 years. The Senate President is responsible for appointing committee chairs and certain members of leadership. Members of both the House and Senate propose bills which may become laws. Bills must pass both the Senate and the House before going to the governor for approval or a veto. Members of the Legislature can override a governor’s veto if two-thirds of both chambers vote in support of doing so. The Senate is also responsible for reviewing and confirming non-elected appointees of the governor’s administration. Only legislators may introduce bills. After a bill is introduced, it is printed and sent to a ­committee for a hearing. Each bill must be read by title on three different days in both the House and Senate before it is passed. In practice, the readings mark key stages in the movement of a bill from introduction to passage. When a bill is called for its second reading, amendments (changes in wording) previously approved by a standing committee, are adopted. Amendments can be offered by any member, but are usually referred to a standing committee for consideration. When a bill is called for its third reading, it is voted on for passage. A roll call vote is required, and a majority of the members elected must vote “Yes” to pass a bill, 30 votes in the Senate; 60 votes in the House. Before a bill becomes law, it must be presented to the governor. He may sign a bill into law or send it back to the legislature for changes. He also may veto or reduce an appropriation item, or he may veto the entire bill. The legislature may agree or disagree with the governor’s changes or veto of bills. If the legislature disagrees, it has the power to override the governor’s changes. The Illinois legislature first convened in this Capitol building in 1877. 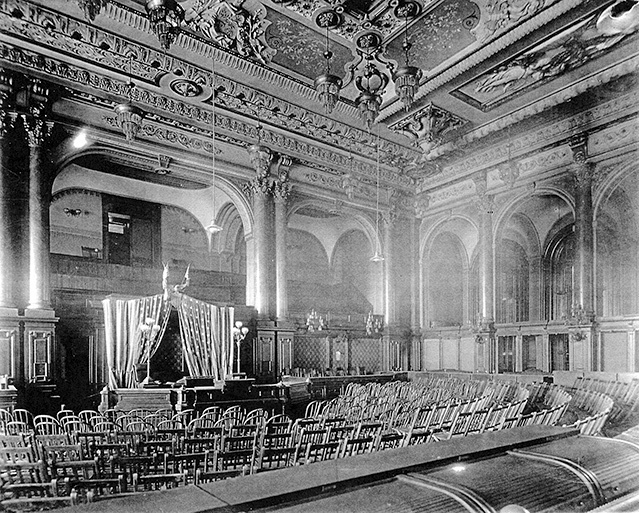 While parts of the Senate chamber have changed over time, the podium for the presiding officer, space for the administrative officers of the Senate and some type of seating for each senator has remained virtually the same. In 2001, the ceiling of the Senate Chamber began to crack. As pieces began to fall to the floor, the final months of the 2001 Session were conducted with protective netting so that members would not be hit with falling plaster. That summer, the Senate took on the task of restoring the Senate ceiling. 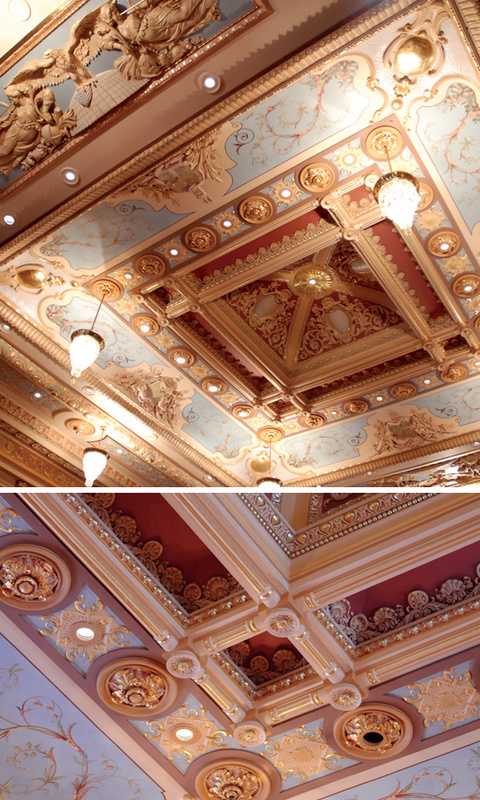 The ceiling in the Senate Chamber today is decoratively painted plaster molding (also called Carton-pierre, which is French for ‘stone carton’ and is a term used for papier mâché decorated to resemble stone, wood, or metal, and used as ornamentation). This process was popular in France in the 1860s and 1870s. The original ceiling had a lay light with a skylight above. In the 1930s the lay light was closed and infilled with plaster. There are many who would like to see the ceiling again include a lay light, and design for such a project is under consideration. Renovation of the Senate Chamber continued in June 2006, after adjournment of the spring session. 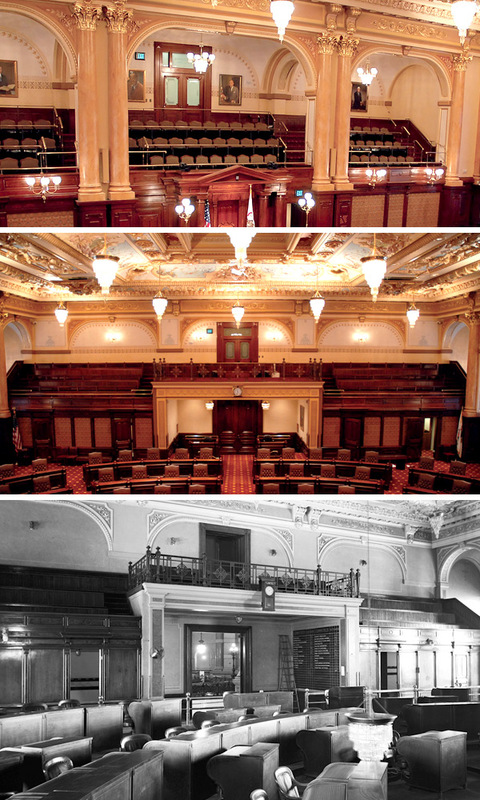 The Senate Chamber was stripped down for a complete renovation of the podium, members’ desks, walls and the galleries. The goal was to renovate the Chamber back to the look and feel of the 1880s. The senators’ desks are roll-tops made of mahogany with a walnut burl. There are 66 desks connected in semi-circled rows facing the President’s podium and separated by the main aisle. Typically, the Republican Party members sit to the President’s left and the Democrats to the right. When one party has more members than seats on one side of the aisle, some members of that party will sit on the other party’s side. 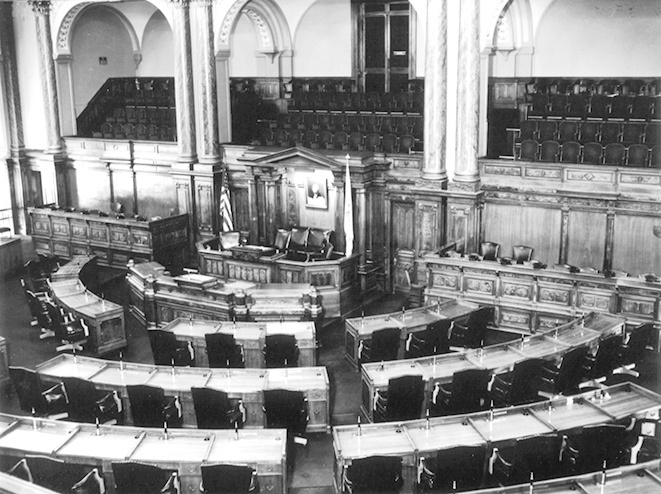 The Senate chose to install roll-top desks for state senators during the renovation, which are reminiscent of the roll-tops that first appeared in the Senate around 1911 – believed to be the first replacement to the original desks. Today, the roll-tops cover the senators’ voting boxes, laptop computers and personal papers. The senators’ voting boxes are linked to the President’s podium and voting board to ensure that senators have the ability to speak on a measure and that their vote is recorded. The laptop provides the senator with up-to-date information on each legislative matter being debated along with their staff’s analyses and any notes they might have made. The President’s podium in the Senate consists of the upper podium used by the President or presiding officer and the lower podium, which is used by the Secretary of the Senate and contains space for individuals who perform the administrative functions of the body. The current podium is mahogany with a walnut burl. Approximately 25 percent of the podium’s wood is original to the 1870s. As part of the renovation, podium lamps (or torchiers), which are reproductions of the originals, were added to the upper podium. Also original to the chamber are all the wood pediments and columns behind the podium. From the upper podium, the President or presiding officer sits above the body to preside over the legislative process. 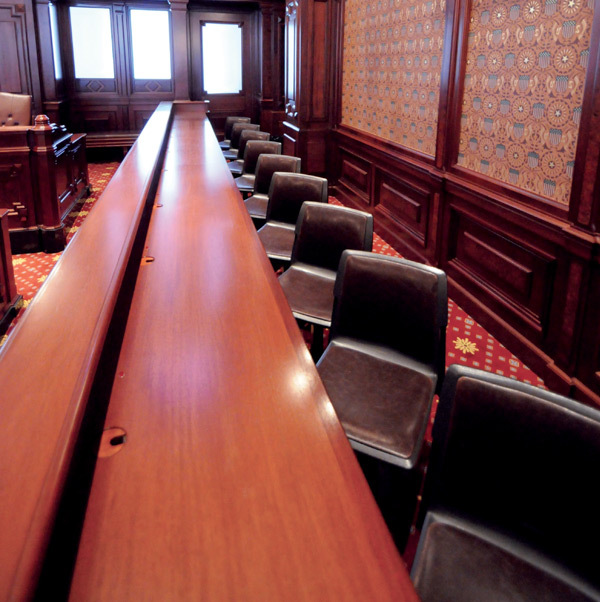 Since the 1990s, the Senate Chamber has received many technological advances. The podium contains a viewing screen so the presiding officer can see information on legislative matters being presented, which senator may be seeking to speak, and, once a vote has been taken, the presiding officer can see the roll call and vote totals. The presiding officer also controls the three cameras in the Chamber that are connected electronically to a sound system, which can be heard throughout parts of the Capitol and on the internet. 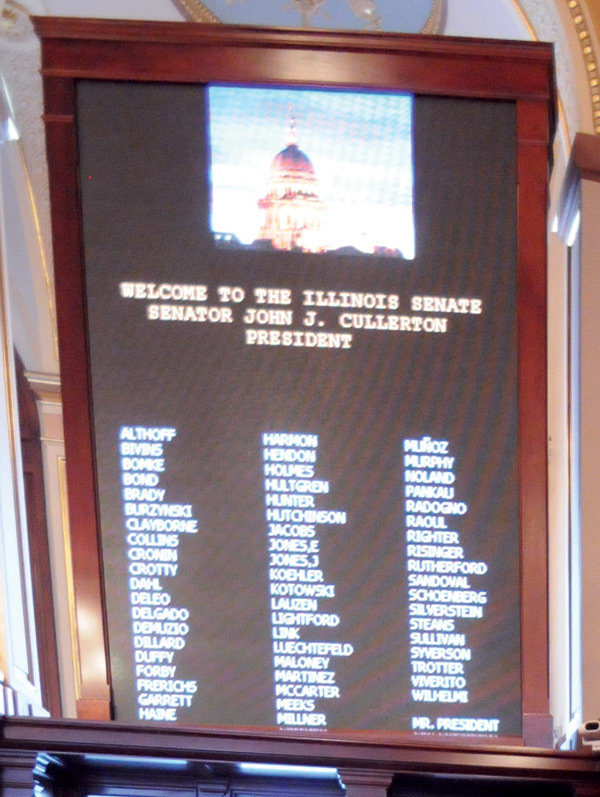 Live feed of the Senate when it is in session is provided through the General Assembly website, www.ilga.gov. There are two video displays in the Senate Chamber, each angled to ensure maximum visibility for senators and staff from all areas of the Senate floor. Each display is approximately 8x10 feet and is made up of 35 LED displays. The top portion of the display area allows either the camera feed of live session action or a still image to be shown. The center is for the text of the current legislative matter or for a message. The bottom portion features an alphabetical list of all 59 senators. During a vote, lights appear next to each senator’s name indicating the manner in which they voted. 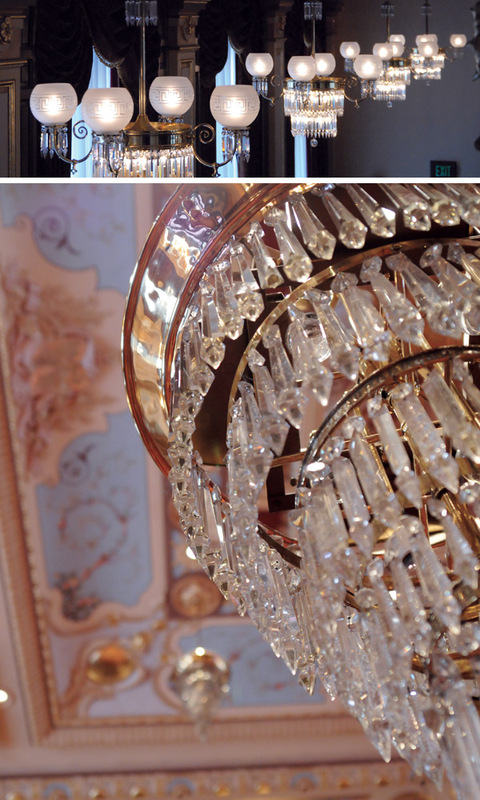 The chandeliers in the Chamber are original to the Capitol. They are brass with crystal from the Czech Republic. Originally burning gas, they were converted to electric in the early 1920s. The wall sconces, which at one time were completely removed from the Chamber, were reproduced from photographs to mimic original lighting. And, as mentioned previously, the lamps on the President’s podium were reproduced from photographs to mimic original podium torchiers. The side walls of the Senate divide the working Chamber (also referred to as “the floor”) from the side aisles that were created to provide access for guests and for groups and individuals who may wish to speak to a senator on an issue before they go onto the Senate floor. As part of the renovation, double-etched glass was added to the side walls to allow natural light in the Chamber. The glass replaced paneled wood walls, which were constructed during a major renovation in the 1970s. Some suggest that paneled wood walls gave the Chamber a darker, more somber feel. There is photographic evidence of a time when there were no side walls. 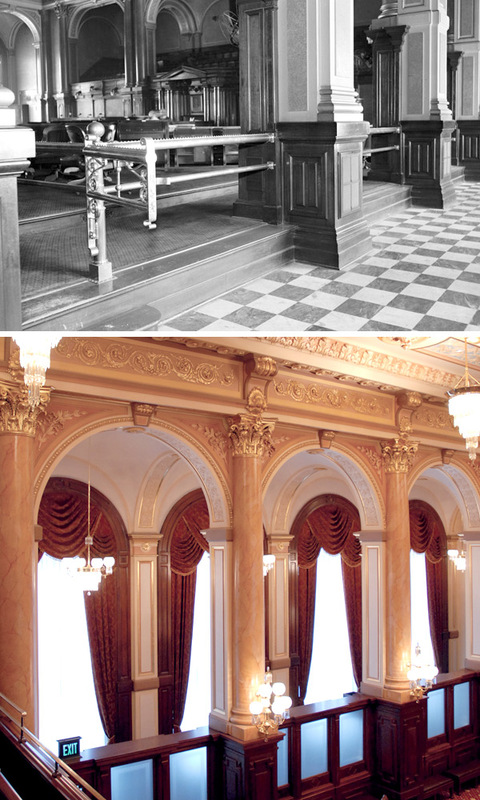 Instead, brass rails separated senators from visitors and lobbyists (as seen in the 1944 photo above), similar to the brass rails found outside the front door of the Senate Chamber. The Senate has brass rail remnants in storage. The front and back walls of the Chamber were restored to stencils from the 1880s found during the renovation of the Chamber. Initially, a fabric cover had been picked to replace wood paneling from the 1970s, but during demolition, once the wood panels and wainscot were removed, workers discovered two identical stencils — star shapes with gold leaf accents that had been lost to history. Paint experts identified two color palettes and the decision was made to use the oldest in restoring those areas. 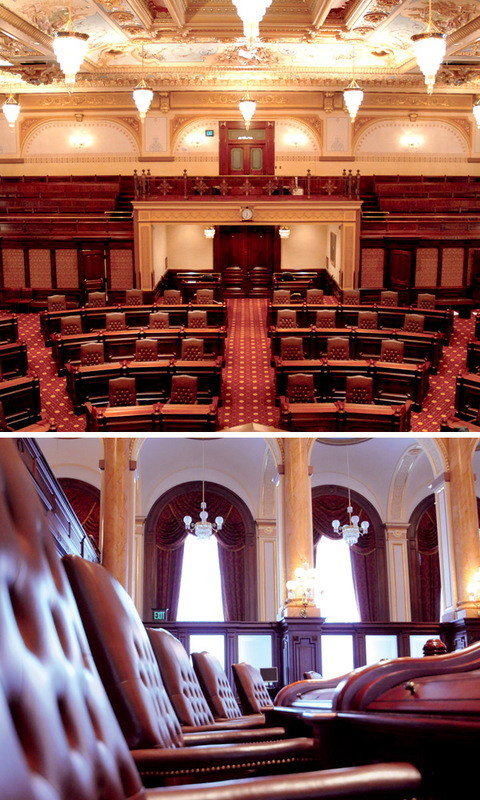 The Senate Chamber has two galleries for guests to view the actions of the Senate. The gallery behind the President’s podium is referred to as the President’s Gallery. It seats 76 people comfortably. The President’s Gallery is home to the portraits of the six immediate past Senate Presidents. They are Senator Cecil A. Partee (President Pro Tempore 1971-72, President 1975-76), Senator William C. Harris (1973-74), Senator Thomas C. Hynes (1977-78), Senator Philip J. Rock (1979-1992), Senator James “Pate” Philip (1993-2002) and Senator Emil Jones Jr. (2003-2008). The Visitors Gallery is accessible through the rotunda and seats 72 visitors. The cast iron railings in the Visitors Gallery are original to the Chamber. The open area they encase is a viewing area for disabled visitors and is also the only place in the Chamber where the press are allowed, with permission from the Senate, to film using video cameras. The enclosed seating on each side of the President’s podium are press boxes and are used by members of the press while the Senate is in session. To have access to the press boxes, the press must have identification issued by the Senate President’s Office and permission from the Illinois Legislative Correspondents’ Association. 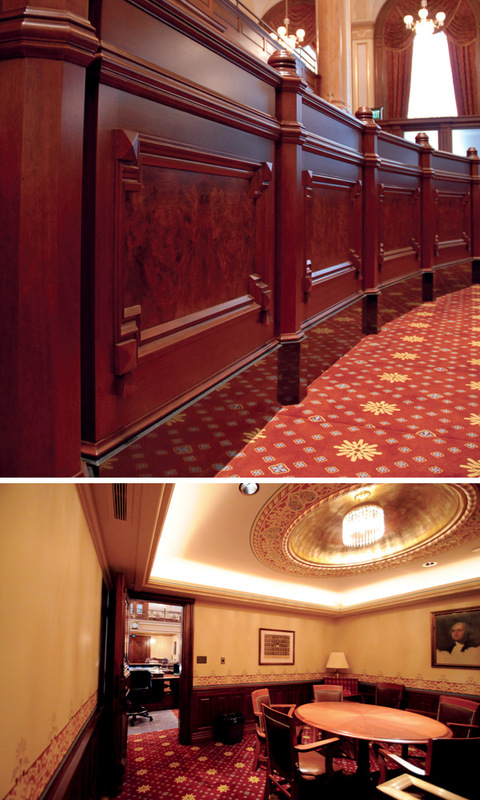 The carpet in the Chamber, galleries and hallways is hand-sewn Wilton wool carpet. The pattern was specially designed for the Senate using photos and other historical information concerning the colors and designs that would have been used in the late 1800s. The back of the Chamber contains a women’s restroom, a men’s restroom and two phone rooms, one on each side of the aisle. There are booths in each of the phone rooms for senators to speak privately on the telephone provided or on personal cell phones. On most session days, senators can also find beverages and snacks in the phone rooms. Interestingly enough, the original Senate Chamber did not have a women’s restroom. Women senators had to leave the Chamber to find a restroom. Directly behind the President’s chair at the upper podium is a room called the Ante Room. It is a small conference room used primarily by the Senate Committee on Assignments. It is also used to house guests of the Chamber while they await introduction.